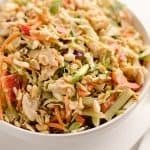 Thai Peanut Chicken Crunch Slaw Salad is an easy & healthy 20 minute salad that is loaded with fresh flavor and crunch! 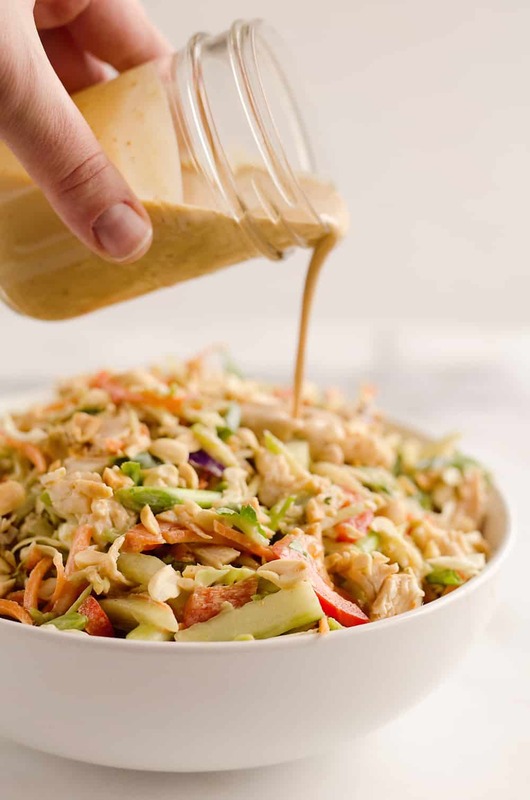 Coleslaw and broccoli slaw are tossed with cucumbers, carrots, bell peppers and chicken and dressed with a homemade Thai Peanut Sauce for a hearty serving of vegetables in a salad you will love. I went through lots of recipe testing before I came up with the perfect Thai Peanut Sauce. It is a light and fresh sauce with lots of depth of flavor. It works amazingly well on everything from Thai Peanut Lettuce Wraps to Thai Peanut Chicken Flatbread. When the sauce is cooked down in recipes like these, it intensifies the richness of the sauce which really boosts it’s flavor. 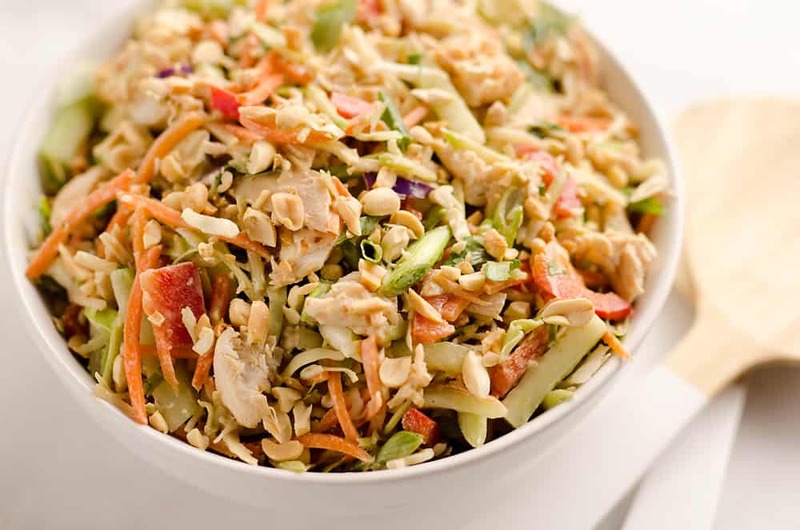 It also works great when you are wanting to add a lighter flavor to dishes like this Thai Peanut Chicken Crunch Slaw Salad. I have been aware of my lack of veggie intake lately and been making an effort to eat more vegetables on a daily basis. 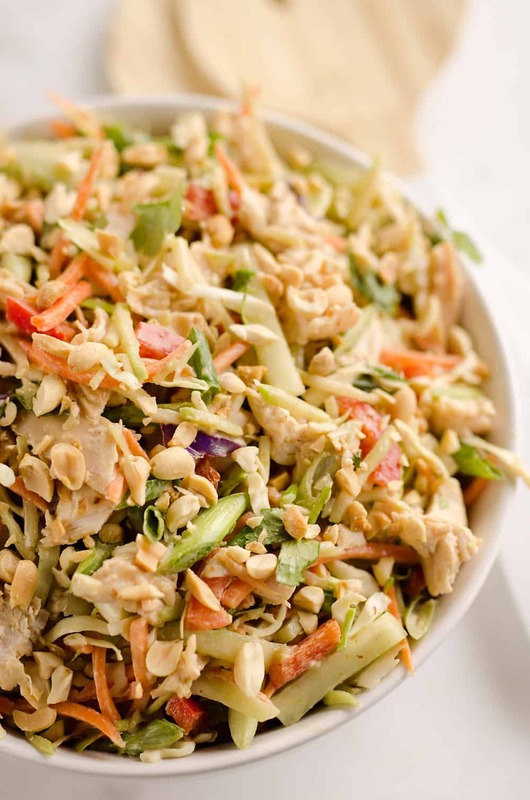 This Thai Peanut Crunch Slaw Salad serves that purpose wonderfully. 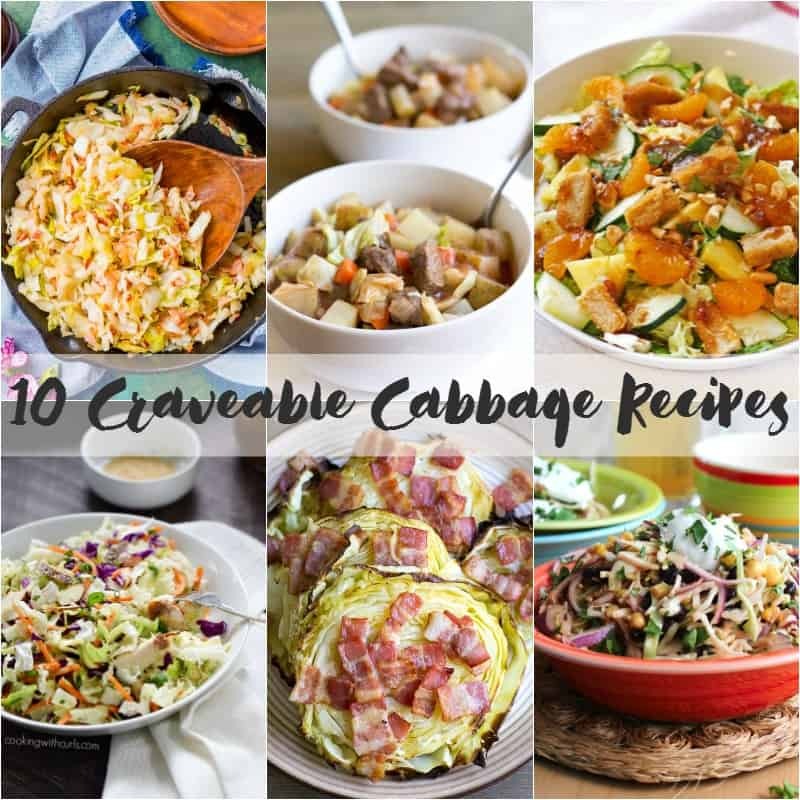 It is loaded with a variety of fresh veggies, including cabbage, carrots, broccoli slaw, bell peppers, cucumbers and green onions. The chicken, peanuts and Thai Peanut Sauce add a richness and boost of protein that makes it a complete meal perfect for lunch or dinner. 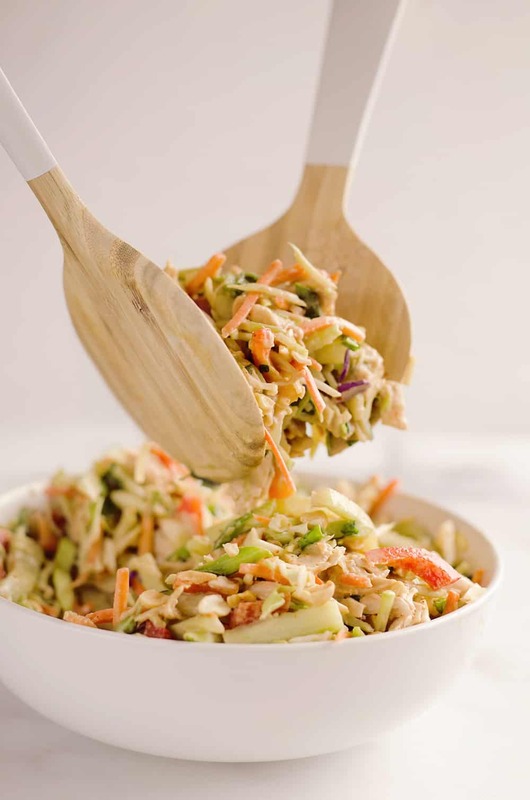 Whether you are looking for a great dish to share at a pot luck or wanting to change up your lunch routine, you need to give this Thai Peanut Chicken Crunch Slaw Salad a try! It is full of flavor, crunch and healthy vegetables that will leave you feeling satisfied. Toss all of the vegetables and chicken in a large bowl. Toss with the Thai Peanut Sauce & lime juice until everything is well coated. Top with peanuts and serve immediately. Is the light coconut milk out of the can or did you se the refrigerator brand? I used the canned type for a richer coconut flavor. Hey Danielle, this looks awesome! Question, if you were making this ahead of time for lunches would you suggest leaving the dressing off until you’re going to eat it or does the lime juice help it not get too funky if you put the dressing on all at once? Hi Libby, you definitely want to wait to dress this right before serving! It will get a bit mushy otherwise. Hi, if i want to make this as a side, what mannish would you suggest? 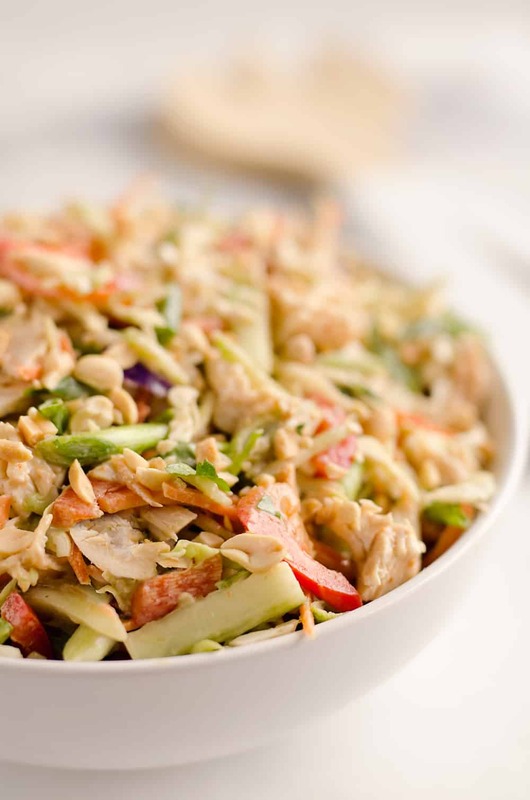 This would pair great with a shrimp kebabs marinated in lime juice and olive oil or if you leave out the chicken in this salad, you could pair it with some grilled chicken breasts or steak. We just had this for dinner. That sauce was incredible! That a hearty, delicious, healthy, salad! I will definitely be making this again. The sauce is my FAVORITE! So glad you enjoyed it. The recipe was not included when I read it today. I just double checked it and it appears to be there on my end. the penaut thai sauce calls for “red rice vinegar” I think its rice vinegar instead. I’m not usually a salad person, but this was really good and filling! 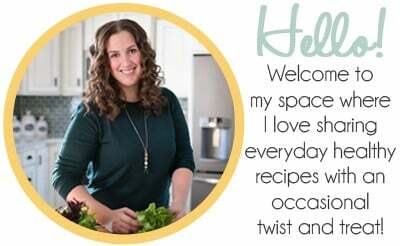 It’s hard to find recipes that are healthy, easy, reasonably cheap and actually good. I’d make it again. Hi! Would you be able to store this for a few days in the fridge or is the sauce better left separate until I’m ready to serve it? This does not store well with the sauce for much more than a day. I would definitely keep the sauce off until shortly before serving, but you could certainly prep the rest of it a few days ahead of time. I’m having trouble looking for broccoli slaw at the store, is there somewhere that usually has it? It’s not by the normal coleslaw at my store, it’s by the baby carrots. I just made this salad for my lunches for the week! I do love the dressing and will definitely be keeping that for future use. The salad itself was a little lacking for me. I added some candied ginger but also think cranberries, chopped apples, sesame sticks, or some other flavorful element would upgrade it just a bit. Thanks for the recipe! I have made this twice now. It is easy and delicious. I did try adding Siracha and Fish Sauce to the peanut sauce and really liked the additions. Also, sometimes I use napa cabbage instead of the bags of slaw mix- more work but also good. My family loves this dish and it has become a standard for dinner! Those all sound like great additions! I! I’m from Argentina and here there are no cole slaw at the store. Could you tell me what is in it so I can make it myself? Also the Broccoli slaw. Thanks a lot! 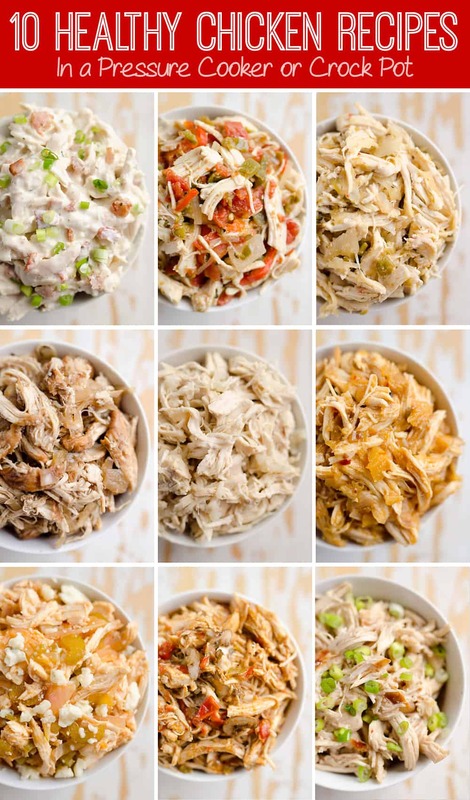 Coleslaw is essentially just shredded cabbage with a little shredded carrot. I just updated the recipe with the nutritional info!